Google books can be viewed online but there is no way to make the contents available offline easily, Google book download is tools to download parts or entire books in pdf format. it is quite easy to use like a browser, one-click to download any book available in full view from Google books. One-click download, Manual mode for download copy-protected books. Automatic mode for download public domain books and pdf document. 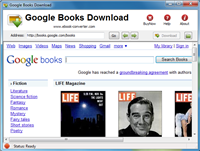 Qweas is providing links to Google Books Download 3.0.1 as a courtesy, and makes no representations regarding Google Books Download or any other applications or any information related thereto. Any questions, complaints or claims regarding this application Google Books Download 3.0.1 must be directed to the appropriate software vendor. You may click the publisher link of Google Books Download on the top of this page to get more details about the vendor.